it's a CORVORADO (Corvette + Cadillac Eldorado) design and hand build by Les Dunham, Boonton, NJ. It's real a Corvette C3. A SuperFly -Car from the world best designer. Please Admin, rename this Car to CORVETTE C3 CORVORADO! Are you sure that it is one of those? i am 1000% sure, that is a Corvette C3 CORVORADO, design and handbuild by Les Dunham, Boonton, NJ, USA. I have the Movie SuperFly on US-DVD (NTSC). Bonus is a smal Movie about Les Dunhams CORVORADOs with Les Dunham self. I am a very big Les Dunham Fan, a error about the SuperFly -Cars (now is the name "PIMP-Cars")is not possible. This is Number 51 from only 50 !!! i have again controled the SuperFly Movie Car. It is (i think so) realy a Cadillac Convertible with design from Les Dunham. The Steering-Weel is with Cadillac-Logo, the Instruments too and also the Air Condition -Parts. I will write to the Les Dunham Agent for more Information about this early \"CORVORADO\". The Les Dunham Agent had written me aprox. 3 year ago, that Les Dunham have PIMPs nearly only on CORVETTE-Basis. The SuperFly car too and so i have ordert the Movie. Now, i will wait for more information and then post the answer here. To answer your question, the car in the Superfly movie is an Eldorado (not a corvette). It was customized by Les in the early 1970's. It is a Cadillac and not a Corvorado. This car is not a Corvorado, it's originally a 72 Eldorado . 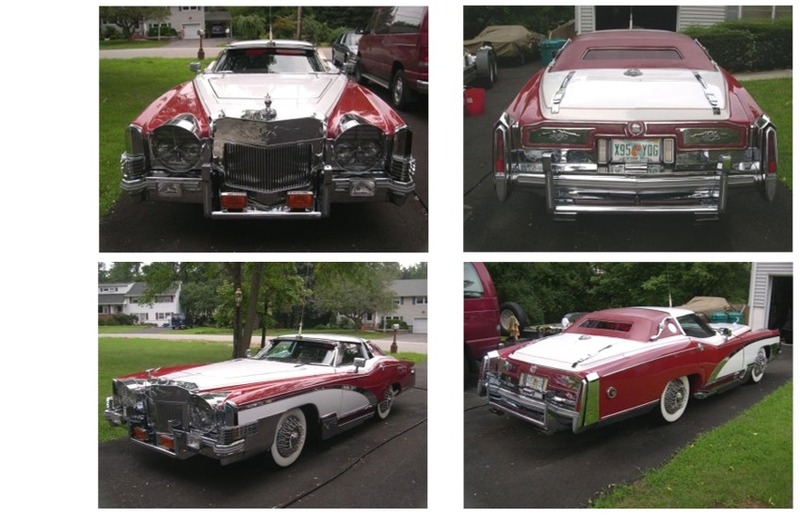 in fact, look at the length between the Eldorado and Corvorado including shape. My mistake, i've meant 1971 ELDORADO, not 72! @Raul1983: Congratulations Raul. I guess it was very difficult for you to get this film. Pimp with the BIG RED HAT he made a cameo in the movie "Superfly" it was his Caddilac. The roof was a convertable it looked like Patten Leather Black with specks of silver in it.This was a few months before the movie came out.This was PIMPIN !